TRIVIA of Noh : Q97 : Japanese people didn't used to have back pain? | Home | Trivia | Q97 : Japanese people didn't used to have back pain? Japanese people didn’t used to have back pain? It is said that Japanese people didn’t used to have back pain. Many reasons are cited having to do with old Japanese customs, including the wearing of the belt-like obi and sitting in the seiza. 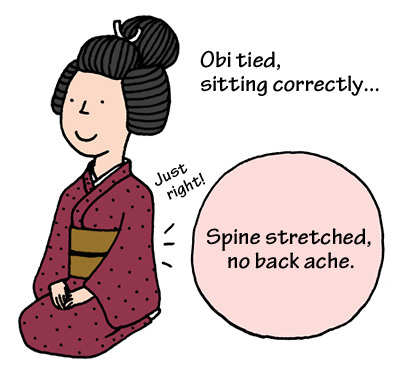 Back pain and posture are closely related, and wearing the obi naturally extends the spine. This is because tying the obi around the pelvis straightens the line from the head, down the spine and to the lower back. The obi used to play the same role as waist bands worn by those with back pain now do. Then there is the seiza. In Noh also, when the vocal are sung, seiza is the basic position. The voice is produced from the belly in Noh chants, and many people have experience how sitting in seiza allows the belly to relax and it become easier to speak or sing. Seiza is a uniquely Japanese way of sitting that started in the Edo era with the samurai class in which the bottom rests directly on top of the feet and a straight line can be drawn from the top of the head through the spine, naturally creating good posture. When the posture is extended like this, there is less stress of the lower back, drawing awareness to the diaphragm and naturally bringing strength to the belly. In ancient China, “head empty, belly full” was said to be the basis of good health. It was said that with the head relaxed and the belly full of energy one could live a long happy life. This means that the ancient Japanese were naturally taking care of their backs by wearing obi and sitting in seiza.